Symphonic Metal is a genre of music that has been toyed with for decades and to varied success. Bands like Epica and Within Temptation made a big splash and for good reasons. If you are a fan of Epica, chances are you will like Xandria. Xandria is a German band who serve up generous heaps of symphonic 'epicness' and weave it with old school, thrashy metal riffs and operatic vocals. Manuela Kraller does an excellent job providing the vocals, which mostly stay in a lower range. She doesn't go too high or hold notes for too long, which makes for a rewarding listen. I would almost consider Xandria to be rock. They don't use harsh vocals, nor do they present a dark, somber, almost gothic atmosphere like Within Temptation. What I like about this band is that they are neither over-the-top symphonic nor overwhelmingly metal. They find the right balance between punchy, chugging metallic guitar riffs and soothing, atmospheric symphonic sweeps. 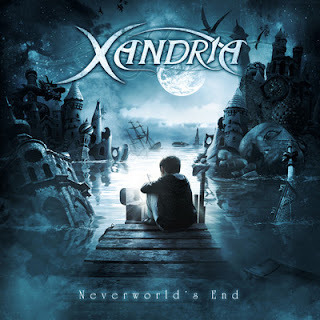 When I first heard about Xandria, I was excited to hear an album by them. I considered purchasing "Salome-The Seventh Veil," but decided to hold on for their new album, which was to come out within a few months. A few months ago, "Neverworld's End" finally did come out. I was once again pleasantly surprised, for the band had improved in both execution and production. It was a good purchase, which may lead me back to purchasing "Salome." Take a listen to Soulcrusher below. Thanks for reading and enjoy! I loved this track! Symphonic metal at its best for sure! Good job!